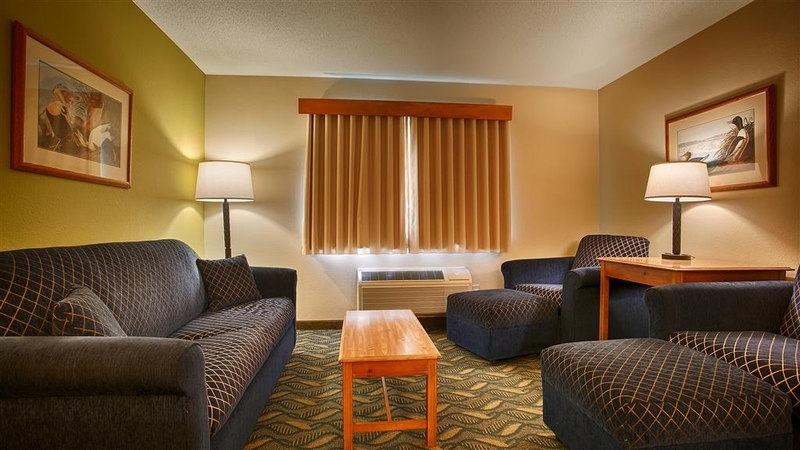 Das Best Western Rivertown Hotel & Suites ist ideal in Red Wing Stadtzentrum zu finden. Erleben Sie ein schöner Aufenthalt in der Nähe von alle Sehenswurdigkeiten. Bestpreisgarantie und exklusive Angebote. Erleben Sie im Best Western® Rivertown Hotel & Suites die herrliche Natur, spannende Unterhaltung und den eleganten Luxus von Red Wing, Minnesota. Die Stadt ist ein beliebtes Ausflugsziel für Naturliebhaber und Abenteuerlustige und wird seit kurzem vom National Historic Trust for Historic Preservation unterstützt. Weniger als zwei Kilometer vom mächtigen Mississippi entfernt, bietet dieses bezaubernde Hotel die perfekte Lage zum Erkunden aller Sehenswürdigkeiten der Umgebung, darunter 15 Lokalveranstaltungen und das Treasure Island Casino. Beginnen Sie Ihren Tag im Geschichtsmuseum von Goodhue County, und besichtigen Sie dann berühmte Raddampfer wie die Mississippi Queen, Delta Queen und American Queen auf dem großartigen Mississippi River. Aktivurlauber finden am Lake Pepin beste Möglichkeiten zum Sportfischen und Segeln oder können mit einem Mietrad zum Cannon Valley Trail radeln, auf dem Urlauber zu Fuß, auf Skiern oder per Fahrrad unvergessliche Aussichten erreichen. Verpassen Sie auch nicht die Gelegenheit, in Red Wing durch wunderbare Galerien und Geschäftsviertel zu bummeln, darunter das Frontenac Welch Village und den Red Wing Pottery Place. Dank der Nähe zu lokalen Unternehmen und nationalen Firmen wie Red Wing Shoes®, Riedell® Ice & Roller Skates und Red Wing Stoneware ist das Best Western® Rivertown Hotel & Suites auch für Geschäftsreisende ideal. Das Hotel liegt in der Nähe der Red Wing Bridge und eines AMTRAK-Bahnhofs, sodass Sie jeden gewünschten Ort günstig erreichen. Nach einem erholsamen Tag in der Stadt werden Gäste mit komfortablen Zimmern und einer unerwartet umfangreichen Ausstattung verwöhnt. Wählen Sie unsere eleganten Luxussuiten mit Whirlpool, ein thematisch gestaltetes Zimmer oder eine unserer Standardsuiten. Jeder Gast kann kostenlos unser 24-Stunden-Fitnessstudio und das Schwimmbad im Innen-/Außenbereich nutzen sowie morgens ohne Aufpreis ein köstliches komplettes warmes Frühstück mit frischen Säften, Waffeln und Backwaren genießen. Reservieren Sie noch heute zum günstigen Preis im Best Western® Rivertown Hotel & Suites, und erleben Sie einen unvergesslichen Aufenthalt im schönen Red Wing, Minnesota! Wir wünschen einen schönen Aufenthalt. Our whole stay was relaxing and fun! The bed and pillows were amazingly comfortable and soft. The room was clean and had extra perks with the towels made into animals. The breakfast had lots of hot and cold choices and the cook was so friendly and asked us different choices we wanted! Very nice, well maintained up to date room. Friendly and helpful check in clerk. Quiet. Typical breakfast nothing to rave about. There is an attached Perkins Restaurant wich may be a better option.Would recommend to friends and family. We travel a lot. This is by far the worst place we have stayed. We expected much better for the $180 price. There is a dank smell that greets you upon entering the facility. That should have been the first clue to turn around and go elsewhere. Next up was the incompetent front desk help who had not been properly trained to operate the room key activation gizmo, and acted like it was normal to spend 15 minutes attempting to get a key for someone. That was closely followed by the rude “manager” who finally managed to produce a room key. The room was damp. It smelled musty. It was dimly lit and depressing. Sheets were damp. The fridge did not work. Reporting this in the morning was met with apathy. Guess they hear it a lot. We would have been better off sleeping in our car down by the river. Please accept our sincerest apologies for not meeting your expectations. We stayed here on a trip to see bald eagles in the area. It was a good choice. It is right off the main drag. The room was clean and comfortable. The perkins next door is and added bonus. I would recommend this hotel. Glad that you enjoyed your visit to see the eagles! We are conveniently located near apart of the Mississippi River that doesn't freeze over so we get eagle activity year round. We do work very hard to provide large, clean and comfortable rooms. Thank you for choosing our hotel for your stay in Red Wing. Please come again. "Cozy, Quiet, but Pool Disappointing"
We stayed one night while in town for the Louie Anderson show. It was one of the only places still available so we paid more than we normally would have for a hotel. It was very quiet and cozy, which we enjoyed immensely. We also appreciated the soap/shampoo/lotion dispensers in the bathrooms. Nice touch if you forget one of those items. The sheets on the bed were scratchy, however, but the room overall was clean and nice. However, the pool area was very disappointing. We were looking forward to the indoor/outdoor pool but we assumed the outdoor portion would be heated. It was not and as a result, was FREEZING! And there were a ton of dead bugs floating both outside and inside, which was gross. The lack of a hot tub to warm up was also a disappointment. Overall, we would stay here again if the price was lower. We stayed in the king loft room. The hotel is simple, but had nice amenities. We appreciated the complimentary hot chocolate and hot cider with the chilly days. The pool area is nice, though we did not use it. We prefer saunas. The exercise room was small, but adequate. The internet worked just fine. The bed is more firm than I prefer. The loft room includes a microwave, large counter with cabinet drawers and a dorm sized fridge (bigger than the ones we typically see in hotels). The room had two small flat screen TVs. One for the lower area and one for the loft. There was also a 4 person full size dining table. The breakfast was typical with a variety of hot and cold food options including fresh fruit. There were juice options and milk options. We stayed 2 nights and noticed the breakfast options changed. note: We noticed there were no elevators for the upper floor so if you cannot do steps you will want to request a lower floor. Thank you for your well written review! Our king lofts are in high demand. Guest like the spaciousness of the two floors. They are equipped with nice seating area for watching television and reading. We provide complimentary coffee, hot cider, hot chocolate and teas 24/7 in our lobby at our coffee bar. The fitness center is available 24 hours a day for convenience to our guests. 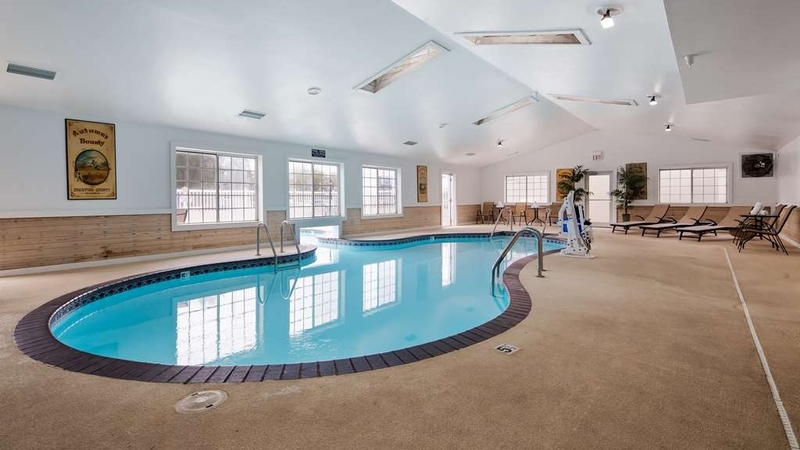 Our heated swim through indoor/outdoor pool is open year round. We offer free internet. Breakfast menu is rotated to offer a variety to our multiple night stay guests.Look forward to having you stay with us in the future! The room had a damp feeling to it and the motel had an odor when entering it. The breakfast in the morning was good with fried eggs, sausage, cereal, rolls, juice/coffee and waffles or french toast. I would stay again at this location but ask to see the room first. Sorry that you were disappointed. We are in mid steam of working on all HVACs to improve their effectiveness. Happy to hear that you enjoyed our breakfast. Please come again. "Awful Damp Not Addressed Adequately"
The room was clean and very large and comfortable. However, it was incredibly damp and got progressively worse. When we informed the management their response was to bring us a large dehumidifier which made the room dry - but also hot and noisy. As soon as the humidifier turned off the damp returned, making the room really uncomfortable. No apologies were given and no attempt was made to actually locate and repair the problem. The hotel location was very convenient to downtown Red Wing, but we will not stay there again. Sorry that we did not meet your expectations. After a long day of driving and sight seeing we were looking forward to a good night's rest. And, we were not disappointed. The rooms are large and very comfortable. I especially appreciate having a couch to sit on while watching TV. The bed and pillows were great and the room was quiet. The only minus is the small bathroom vanity. Would I stay there again? Definitely. Very happy to read that you enjoyed the accommodations. 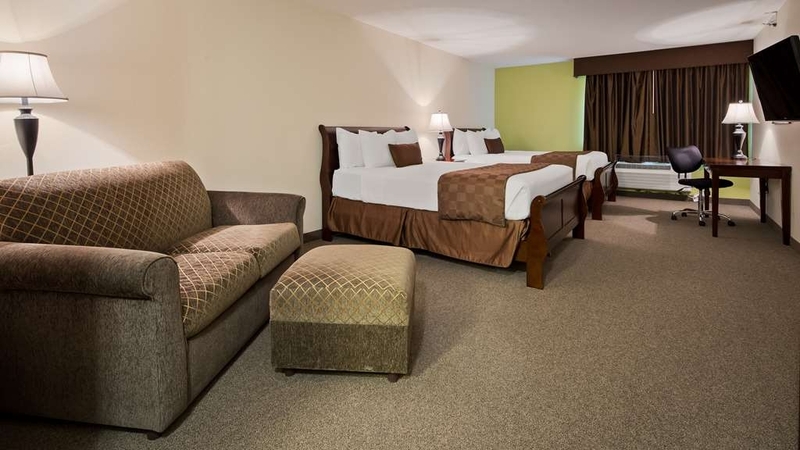 We pride ourselves on our spacious rooms and comfortable seating in the rooms. We provide Dream Maker and Comfortel pillows in our rooms. Please do stay again. Not only was the hotel wonderful - clean, comfy beds, huge rooms - but the staff was very attentive. I checked in during a shift change, and not only did the front desk agents stay later to check me in, but as they were leaving, they saw me carrying all of our stuff in and asked if I needed any help with it! Everything about the hotel was wonderful. "Stop over after embarking American queen steam boat"
Thrilled with your comments! Our entire team works hard to provide a clean and friendly property for our guests. Please come stay again if your travels brings you back to our neck of the woods! Very happy with this hotel. This is our second time staying here. Staff is always friendly. We had a whirlpool suite which was beautifully decorated. Our room was very clean and overall appearance was nice. Himalayan salt lamp was a nice touch. Breakfast was a great selection, clean and the staff kept it stocked. We will stay again if in the area. Welcome back!! Nice to hear that you like the Himalayan salt lamp. We do work very hard at offering a variety of breakfast items. Our entire team works very hard to maintain a clean and inviting environment for our guests. Look forward to seeing you in the future! I booked this site since I was going to a Jerry Lee Lewis Concert at Treasure Island Casino. I chose it for two reasons, the cost and the location. It was located at the west end of Red Wing and afforded the opportunity to get to town quickly as well as the Casino which was only 10 miles from the hotel. Thank you for your review. We truly appreciate your business. Our hotel is conveniently located off of Hwy 61, nestled into a bluff. Quiet and convenient. Please come again! "Like sleeping in a damp basement!" Our apologies for not meeting your expectations. I most certainly will share your comments with staff and take appropriate action. We have a renovation planned for over the next two years. New and exciting things ahead! "Clean and comfortable room, good breakfast!" We have stayed here before and will come again. We have found we can depend on a clean, comfortable room and very good breakfast for a reasonable price. There is a nice pool available which we may use sometime in the future. One online review made me hesitate in booking but everything was better than we expected. It was a large room and had a giant hot tub. The staff were friendly, everything was clean and neat. The breakfast was fine. I wish we had stayed for two nights instead of one. We will be back! Very friendly and helpful staff. Told us about local events we weren't aware of. Our room was just recently remodeled. Everything worked as it should. Extremely good experience. 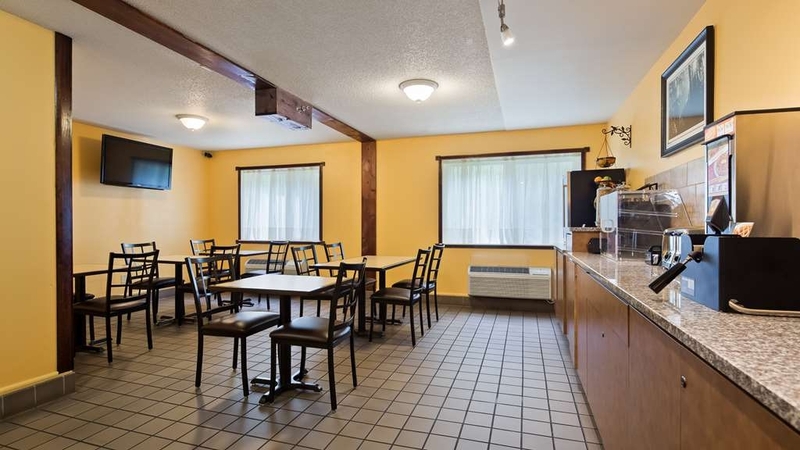 Hotel is located quietly off the highway and easy to access. Thank you! Guest like you make our hearts sing! We work very hard to provide an amazing experience. We hope to see you in the very near future! "Perfect for a Quick Getaway "
We came down to Red Wing for a super quick get away. The location is nice and close to downtown and there is a Perkins Restaurant right next door. The room was very clean. The furniture is showing wear, but not uncomfortably so. The bathroom was nice and clean with updated fixtures. Perfect for the price we paid!! Happy to hear that you found our accommodations perfect. Shay and her team work very hard to provide a clean room for our guest. We will be updating furniture in the near future. Nice to read your comments regarding bathroom updates. Please come again. We truly appreciate your business. We loved our nice, roomy guest room. The bed was great; bathroom was clean and roomy; lobby was attractive and inviting. We arrived early but checking in was no problem as our guest room was ready early, too. Thank you for your comments! Nice to hear that you enjoyed your spacious accommodations. Our entire staff work very hard to provide a clean and enjoyable experience. Please come and stay again! We were in the area for a concert at the Sheldon Theater. We thought the Inn--Clean, updated facility. Reasonable rates. Friendly staff. Perkins next door. Enjoyed our stay and will return if ever in the area again. Thank you! Shay and her housekeeping team work very hard to provide clean accommodations. Concerts at this Sheldon are always very nice. Please do stay with us again! I'm not sure why this location is so poor, I've stayed at many Best Westerns before. The rooms are dank smelling and drab. Somehow the coffee tasted brutal, the shower dripped and there was weird loud noises in the room directly next to us at 7:00 am. Not to mention they had lost my reservation when I began checking in and I had to spend valuable bar time pre-concert drinking trying to get a room at this place instead. Thank you for your comments. Sorry that we did not meet your expectations. I will look into the issues that you experienced. We attempted to stay in our rooms after we attended an event at the local casino. We checked in at 7 pm, but didn't bring our bags in until 11:00 pm when we returned after the event. Around 1 am when we were going to bed our friends in another room called to say they had bugs on their pillow. I jumped out of bed and threw back the sheets to see a live bug on the mattress pad. We packed up and headed to the front desk. We were asked if we were sure it wasn't ants. Nobody attempted to go view our room with us. We asked for a refund for the two rooms (and nothing more) which we were told we'd get. We were given no other options or accommodations so we drove the 1 1/2 hours home. Upon numerous attempts to call and get our refund, we've been told that because we posted a review elsewhere that we were set to get a refund and then they changed their minds because of the review. Our personal information has also been brought up as a possible threat and they also stated that they hoped “karma smacked me in the face”. This was from management. We've been charged for our room and we have paid the bill. This review is 100% credible with documentation to prove it. "Large room & comfy bed"
We stayed a couple nights. When we arrived, they didn't have our reservation. They still got us in. We requested a newly remodeled room and they did accommodate this. The room was big, and the bed was very comfy. There was a lot of variety for the breakfasts with different hot items on each morning. My only complaint is the poor quality of the TV. The TV was new and it should have a really sharp picture so it must be their cable supplier. Why have nice new televisions when you still have crappy cable? Thank you for you comments! We are researching different cable providers in order to provide better product. Pleased to hear that you enjoyed the room. 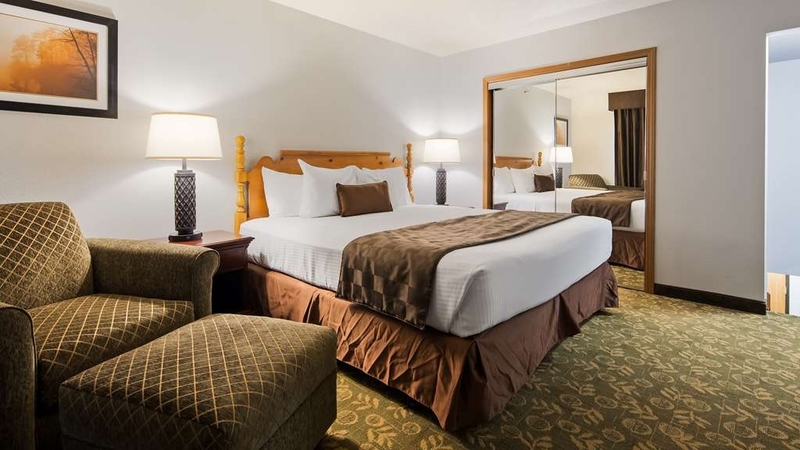 We are thrilled to provide larger rooms to enhance your stay. We strive to provide a variety of hot breakfast items to keep it fresh and appealing. Please stay with us again! "Where else could you swim in the outdoor pool in -4 degrees??" This is our, “go-to” place for overnights with the grandkids, in Red Wing, Minnesota. The rooms are large, and well maintained, the continental breakfast is the best I have ever had, and the indoor/outdoor swimming pool is a swimmer's delight. What an affordable way to have family fun!! Thank you for choosing our hotel for fun with grandkids! Our unique swim thru indoor/outdoor pool is an awesome venue for the family. 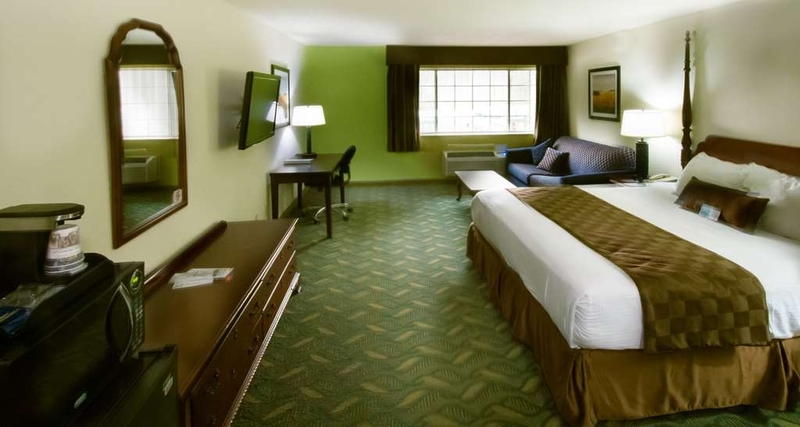 Our rooms are spacious for a comfortable stay. Our enhanced breakfast changes daily to keep it fresh for multiple night stays. Thrilled to be your ‘go-to' place for overnights with grandkids. Decent place to stay and they have made many updates to the hotel in the past couple of years. The breakfast was not very good, they ran out of food before 9:30 and what food they had was cold. The beds were extremely comfortable and the hotel is very quiet. We appreciate your comments. Please accept our apologies regarding breakfast. I have spoken with attendant and used your comments to retrain her. We are in the process of replacing our beds. We pride ourselves on our quiet location set back in the bluff. Please come again!! Best Western Red Wing, MN gave us a very poor, very disappointing experience. The service was unfriendly, unwelcoming; housekeeping was poor to non-existent. We travelers were blamed for their failings. Stayed one night. I could find nothing wrong, all good! Would definitely stay again. Staff very friendly, breakfast was fine. A lot of room, beds comfy. A little bit set back from the road but signage was good, right next to a restaurant which is always good. This is an older hotel in need of an upgrade...I had to leave my window open the entire time to get fresh air to overcome the musty smell. It also had a sign announcing that this location bans guns...I am a strong 2nd Amendment advocate and won't be staying here again as long as that sign greets me at the front door. We are working on updates continually. I respect your opinion regarding banned guns. Thank you for sharing it. We stayed at this hotel while we attended a concert at the casino. The hotel was clean and the price was half of the casino hotel. The facilities were excellent and a special thank you to Tom at the front desk who went out of his way to ensure that our stay was worry free. we would recommend this property. Thank you for staying with us! Shay and her crew work very hard to provide a clean environment for all our guest. Tom is awesome at front desk and carrying for our guest. Thank you for making our Monday morning awesome. Please come again! "Overall really a nice place to stay!" Thanks!! I am so thankful that we were able to accomodate your folks. What a delight your family has been during their stay! True definition of f amily! Hugs from all of us at Best Western Rivertown Hotel and Suites<3<3! I made a return trip to this hotel because my room was so nice the first time - very large, attractive decorations, clean, great bathroom - just really nice overall. It is conveniently located near a good restaurant and is easy to enter and exit from the roadway. I arrived early and the room wasn't quite ready but I made myself comfortable with coffee in the lobby and, when the room was ready, the front desk clerk came to tell me that I could go ahead and check in. Thanks for coming back! Happy to hear that you enjoyed you clean and spacious Room! We have coffee 24/7 in our lobby for our guest to enjoy. Please come again! We were very pleased with our stay at the Best Western Rivertown Hotel and Suites, in Red Wing, Minnesota. The hotel was very clean and super quiet. Our breakfast in the morning was one of the better free breakfasts we have had with a variety of choices. Thank you so much for your review! We work very hard to provide an enjoyable enhanced breakfast of hot items, as well as, yogurts, cereal, pasteries and Build your own waffle bar! Housekeeping strives to provide guests with clean and comfortable rooms. Please stay with us again! 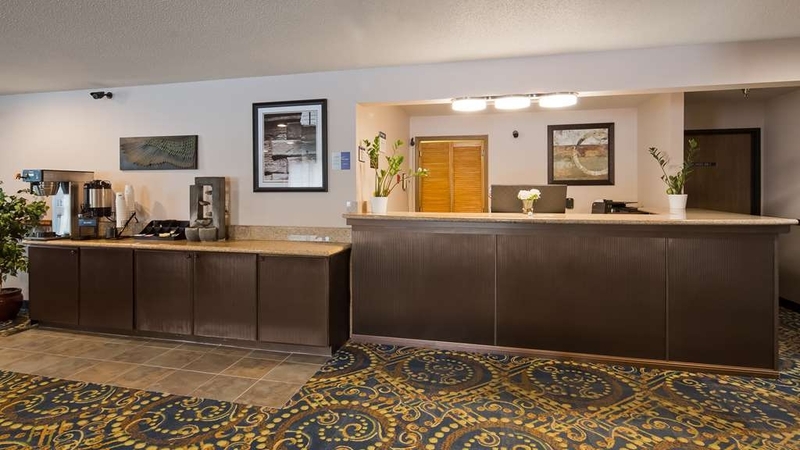 "Business Travel in Red Wing, MN"
I do not recommend this location for business travelers as your travel assignments and work-related chores might be compromised and jeopardized because some front desk people are very rude and very unprofessional. They are not accommodating and they do not care about your needs and interests. If possible, stay away from this location and find other places to stay while in Red Wing, MN even if you are on a leisure trip. This place is so much better than the St. James down the road and for less money was also a great plus ! Clean rooms, very comfy bed and a nice breakfast . very nice & friendly staff .I can't give it enough stars best place to stay in town( of the 3 places I know of any ways ). We are so happy that you enjoyed your stay! We work very hard to provide a great breakfast and comfortable accommadations. Thanks for your compliments. Please stay with us again. "Bad smell and faulty electric"
Our room was spacious. Tastefully decorated, lots of sitting room and a great bed!! Close to a Perkins. Easy access off of the highway. Within walking distance of the Red Wing Museum.Fast and friendly staff!! Thank you! We take great pride in the fact that our rooms are spacious and include a seating area. Our staff is eager to make sure that you have an enjoyable stay! Please come again! I hope this is in every room, but we had two luggage stands. It was great! I didn't have to fight my husband for it. I think the standard in all rooms should be at least 2 stands. Best Western finally got it right! Also the front desk very helpful and cheery. I am happy to hear that you liked the two luggage racks in your room. Your comfort and ease of stay is very important to us. We strive to make everyone feel at home when staying at our property. Please come again! Large comfortable and quiet room, in perfect condition. Staff was extremely helpful. Good value Everything you come to expect from Best Western. If you are elderly or have physical issues request a room on the ground floor. Hotel does not have an elevator. Thank you for your review! 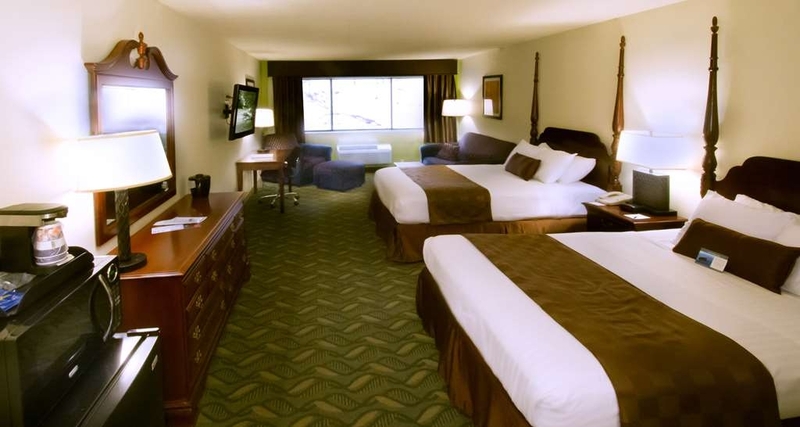 We pride ourselves on our spacious rooms and quality service! Our entire staff goes the extra distance to provide quality product and service. Please come again. 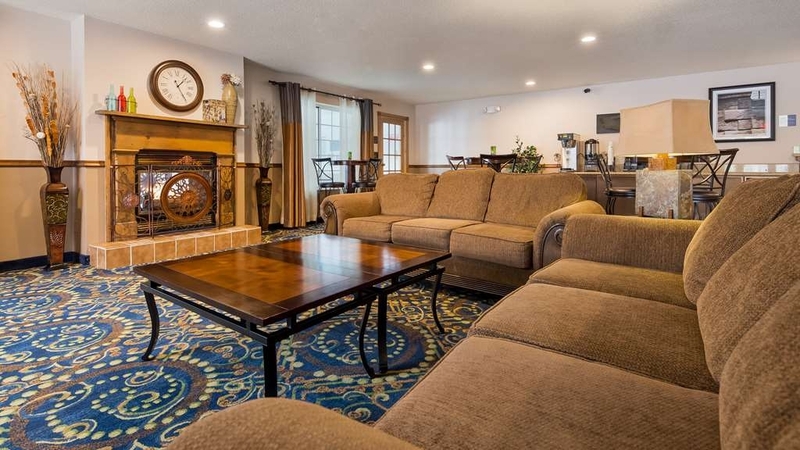 "A great stay at the BW Rivertown Hotel & Suites in Red Wing"
The hotel desk staff, housekeeping staff, and breakfast area staff were friendly, courteous and professional, and all helped us to have a very enjoyable stay. We would certainly enjoy staying at the Best Western Rivertown again. We are happy to hear that you enjoyed your stay! Thank you! Nice locations and room. Good breakfast included. Price OK, this weekend; Room was 5x higher a couple of weeks ago due to a concert in town. Yes they do gouge people on concert weekends. Was quoted about $500 for 1 standard room left (passed). Front desk staff lazy, had a lot of trouble getting them to apply my five $20 BW reward gift cards. Room was quiet, large with walkout patio. Shampoo empty, bath tub drain stopper broken. Overall nice clean room at a reasonable price. Staff lazy. No manager to keep employees on toes? Very nice indoor/outdoor pool! But no hot tub. Thank you for your comments. I have used them to train and make improvements at our front desk. "Friendly staff and large, clean rooms"
Thank you! We enjoy hearing that you enjoyed your stay! Overall polite, clean and priced right if you schedule ahead. Breakfast area is small but clean and good variety of food. Nice front lobby area with tv and laptops. Didn't get a chance to use the pool inside or out but it looked clean and well cared for. Thank you! We strive to over an exceptional product and experience. Please come stay with us again! Stayed in a room that had a very musty smell, like it was mildew, no other rooms available, also had a problem with the card opening our door, had to change it 3 times, had to wait on the staff to help, needed better help and more training. "Extra charge of $128.57 which wasn't in our original booking contract"
Our experience was very disappointing with the door to our room next to impossible to open and cleanliness was not up to our expectations. The young lady working the breakfast area told us because they were short on staff she had to work double shifts. The check in process took forever even though I had my confirmation letter from Booking.com. for 2 rooms at $132.97 per room. In checking my bank statement I had been charged an extra $128.57 which was not part of the ordinal contact. I contacted Booking.com and they pulled up my reservation and assured me that I should have only been charged $132.97 per room and that their booking company takes no reimbursement for their services. Best Western was sent the bank statements as proof of incorrect amounts deducted and has chosen to disregard the complaint. I would hope that Booking.com removes this facility from their service of getting customers for a less than reputable establishment. If my money isn't reimbursed I have no other alternative then to contact The Better Business Bureau. The sad reality is that I grew up in this town and was attending my mothers funeral. I still have MANY friends and relatives living in Pretty Red Wing. Shame on you Best Western Rivertown Inn & Suites!!! Oh and may I ask what type of organization Ramkabir Inc. is which has the same mailing address as the hotel?? Happy to hear that you enjoyed the pool! We are proud to offer a well cleaned and maintained hotel! Hope to see you again! We had really good nights of sleep at this hotel. Would definitely come back and visit here again. Did not use pool or workout amenities but they looked inviting if we were around more and had more time. Thanks!!! Please do come again and next time use the pool and fitness center! It would be nice if the person at the front desk would annunciate his words clearly. He mumbled everything. I am sure it is because he says the same thing to people all day long and may not realize he mumbles. Also, we were never greeted upon entry to the hotel (we came back and forth several times during our stay). When I dropped our key cards off at the front desk, the gentleman did not ask how my stay was nor did he thank us for staying our wish us a pleasant day. Lastly, we left our room at 7:15 am, returned for one hour at 1:30 and were gone again until 10:45pm and our room was not cleaned. (My sister who was located at the opposite end of the hall was away from her room from 7:15 to noon then gone again from 1:30-10:30 got her room cleaned. First, Thank you for taking time to respond to survey. We truly want to apologize for not meeting your expectations. I have relayed your comments to the team members involved to use as a training tool. I appreciate you sharing your comments. Some of the team members our brand new to hospitality and still are nervous. Please consider giving us another opportunity. Thank you! It took 20 minutes to get checked in at the front desk and that was two people checking me in. The door key card didn't work most of the time and an employee came by to help me and said that door needs to be oiled and never returned to fix it. I stayed two days and the room service never showed up the second day to clean the room make the bed etc.. Overall poor service!! Thank you for taking the time to review us. On behalf of our entire team I would like to apologize for not meeting your expectations. We had two major events in town starting at the same time which resulted in multiple guest trying to check in at the same time. We are in the process of hiring and training new staff. I will share your comments with all the staff and use them as a training tool for improving customer service. Please come and give us another try!! "Do not get room with pull out couch." The room was nice enough, King bed loft, but the pull out couch was HORRIBLE. We were very disappointed considering the price point we had to pay to sleep on the rails of a sofa bed's construction. Thankfully this was only for one night. Looks good from afar but lots of issues with not only our stay but friends and family as well. Checked in at 10 pm and our room hadn't even been cleaned! Another guest got into my friend's room with his key and the rooms are very humid with mold and poor temperature control. "'might check out another hotel in the area . . ."
The location was fairly good for us--we wanted to be on the north end of Red Wing and near the Pottery District. We did read some where that the Pottery Museum was just across the street. it is, but it is a busy street and it really is a 4 or 5- block walk. Probably the best thing was the indoor/outdoor pool--we really enjoyed that. We requested a room with a patio/balcony--maybe not the best idea, since it appears people who smoke like this type of room. After we detected a smoky smell, we found a container with many butts was left on the patio table. We did get a different room for our second night, which was a good one, but it seemed quite an effort for the staff to give this to us. We appreciated receiving a paper, no matter week day or weekend. The breakfast left "some things to be desired." We didn't feel anything was replenished or cleaned as we expected. Certainly not terrible, but there are many similar-type hotels in the area--if we came again, we might look into those. On behalf of our entire staff I would like to apologize for not meeting your expectations. We have been going through a transition period we new staff and training. I will most definitely follow up by sharing your comments and impression of our hotel with all staff members. Glad to hear that you enjoyed the complimentary newspaper everyday. Please give us another chance as we strive to improve. The moving of rooms took some juggling as we were quite full and had limited availability. I have trouble traveling due to fragrance sensitivities & allergies. This was one of only 2 smoke free hotels to choose from. It was "okay". Only complaint was the noise of breakfast set up at 5:00 a.m. as it was right across the hall. Sorry about the noise of breakfast prep. We will share your comments with attendant. We appreciate your comments and your patronage. Friendly staff. Well kept motel. Room could have been a little cleaner (it was dusty and needed better vacuuming. Exterior of motel was very good. Restaurant next door. Quiet location. Easy check-in. Price is relatively high, but consistent with rest of Red Wing. Thank you for giving us a review! We truly appreciate your comments. I have shared them with our Housekeeping supervisor to share with her staff. Our property is very quiet as it is tucked into a bluff and away from train tracks. Please stay with us again! The staff was extremely friendly and knowledgeable about the area and where to find things. The room was very big, comfortable and clean. It was an excellent experience! This hotel was close by to downtown Red Wing and conveniently located. I surprised the wife with an overnight vacation at the hotel we spent our first overnight at 10 years ago...it was quiet, conveniently located in Red Wing, had a Perkins right next door (although the continental breakfast was enough for us in the morning). Mid-range in the expense category and I didn't see too much of a "saving" if you were AARP, government traveler, etc. But the rooms are spacious, the beds comfortable and I'd recommend this if you're in the Red Wing area. Easy access to the pottery places and other "must sees" in the Red Wing area. What a great idea you had surprising your wife with an overnight vacation!! How romantic!! Thank you for coming back!! We pride ourselves for our spacious rooms and enhanced breakfast. I come here for business purposes and have stayed approximately 6 times in the past 2 months. It is very comfortable and feels safe and secure. Staff are always friendly and welcoming. Very nice place to stay. Thank you for your review!! We truly appreciate your business! "Making a bad situation better"
Glad that we were able to provide a bit of pleasantness during your difficult time. Thank you for staying with us! The room was dirty/ found a Super 8 donut in the dresser and turned it into the front office,upon check in I informed them of the room smelling like cigarettes. Even though when I checked out my room price was reduced, the problem went unchecked or corrected. Not even a manager attempt to let me know the problem was being taken care of, so when a problem isn't acknowledged from the management, then that's where the problem lays at or within. I work in a professional environment so I know what I say is usually correct. Please take this criticism as a way to reflect and improve on the brand name. Thank you for your comments. I have spoken to the manager on duty at the time of arrival and shared your comments. Please accept our sincerest apology for not meeting your expectations. We met friends for an overnight in Red Wing and were pleased with our choice of the Best Western Rivertown. Enough off Why. 61 to be quiet but very convenient to the Red Wing Pottery museum and downtown with the bluffs. I have stayed at this hotel many times on business when visiting Red Wing. And everything, I've never left disappointed. Staff are great, rooms are excellent. The food next door at Perkins is great. I have nothing bad to aye, it's a welcome bed after a log flight and drive to Red Wing. Thank You for your wonderful review! Love to hear how great our staff performs! Safe travels!! "Very Quite Setting, nestled against the hills, away from the highway." We had a very nice overnight stay at this hotel. We had two, King, accessible rooms reserved and both were ready for us when we arrived. The rooms were very large and well appointed and clean. With the hotel being back away from the highway and nestled against the hill the rooms were very quite and peaceful. We did not use the pool so I can not comment on it but it looked nice, they do not have a hot tub or spa. A lot of things were already out of stock when we went for breakfast but in the hotels defense, we did go a bit towards the end of the serving time. The staff was very friendly and brought out the things we requested so we did have an adequate breakfast. Normal hotel continental fare, nothing great but still wholesome. I would stay here again. and by the way they have a great military/veterans discount, better than the AARP or AAA discount. Thank you for your service to our country! We love being nestled into the bluff. 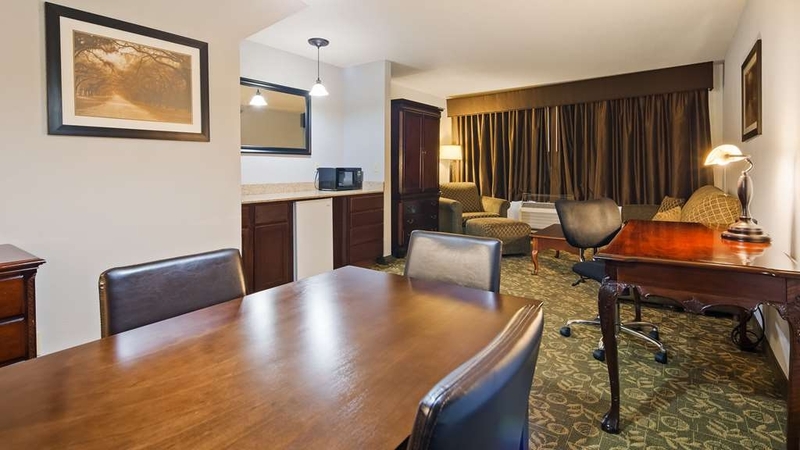 Our rooms are quiet and have ample room for a comfortable conversation area. Please come again! Agree with the other reviewers about understaffing at this hotel. I echo what several have said in their reviews. Extremely small breakfast area, food not replenished, cold food, one person trying to handle everything, etc. The desk clerk said he couldn't give me a receipt because the room had been booked through a source other than BW, which is wrong. It was booked directly through Best Western's website, and I am a rewards member to boot. We have stayed at several BW's and this is by far the worst. We are working on hiring more staff. We unemployment rates as low as they are it is difficult. I researched your reservation. It did come across our system as booked through booking.com. I have initiated a thorough retraining of staff. I would like to apologize on behalf of our entire team for failing to meet your expectations. Please give us another try. The check-in staff was very helpful. However, she was the only person on duty in the whole hotel. When I turned down the sheets in our King/Loft room, I found hair on the sheets! The person at the front desk was unable to change the sheets for me b/c she couldn't leave the desk. There wasn't another room like ours available, so I changed the sheets myself. In the morning, the manager gave me a $50 discount, which was very nice. However, he was not very personable and gave a brief apology at the end of the transaction. The rooms are a bit outdated, and have that certain "old" smell. But the bed was comfortable, and, besides the hair on the sheet, the rest of the room was clean. Not sure if I would stay there again. Please accept our sincerest apologies for not meeting your expectations. We are working on training new staff. Please stay with us again. Room, including bath, unclean and beds not made next day. Breakfast poor quality and poor selection; dry cereals high in sugar, the baked goods were of poor quality; fruit was 2 spoiled bananas; and I had to ask for the egg tray to be refilled. Did not replenish in-room coffee packs the next day. Not sure where to start when giving this place a review. .... Made our reservation about 5 months in advance because we would be attending a concert at the nearby casino on a Friday night. I called about 3 days before to confirm our 2 night reservation and was told we could Check in at 3:00 PM. We actually arrived just before 3:00 to check in. We were told our room was not ready. Several others started checking in also that said they also were going to the casino concert. Almost everyone was told their room was not ready. The lobby started filling up. Two hours passed and we asked the man at the desk if our room would soon be ready. Our plans to go out for dinner was slipping away because we would not have time. Other guests were complaining and some were told they would take 10% off their rooms. We were not offered this.This hotel knew for weeks in advance that they were full so why didn't they staff accordingly? There appeared to be 2 very sweet gals working as a team to clean the rooms. They apologized but this certainly was not their fault. Where was management? We got in our room about 5:30 PM. We talked to others that could not get in their rooms before they had to leave for the concert. They said they had to get ready in a public restroom. There is no excuse for this. Our room smelled so bad from Smoke that our eyes burned. As we were waiting for our room, another guest asked to be moved due to her smokey room. Apparently all rooms are suppose to be no smoking but it was terrible. Pool was not busy and water was comfortably cool. There is a swim in and swim out door which was nice but we had to continually use the net to scoop out live bees floating in the water. Breakfast was below average for hotel breakfast. It's served in a very small room that appears to be a small hotel room next to the front desk. The staff I spoke to were very kind and appologized for the delays. As I write this, I am still here in my smokey room because unfortunately were reserved 2 nights. All of the other hotels are full tonite so we have nowhere else to go. We left for the day and came back to our room that had not been made up. We took out our own trash. After asking f we could have our room cleaned. Someone showed up after 5:30 and gave us fresh towels. If you are still reading this, you should know that there are big problems here. Try checking out some other place. We are working on hiring more staff. Just today, I had two interviews. The unemployment rate is so low that it has been difficult for employers all over Red Wing to find good staff. Apologies for not meeting your expectations. We are using your comments in training. Take care! "Turn down service included hair..."
I will never stay here again, the interior was disgusting, and then when I turned down the sheets there were stains and HAIR in the bed, HAIR! Small, slightly curled. I was absolutely repulsed. I went to the front desk and requested all new sheets. Additionally, they don't use fitted bottom sheets so enjoy sliding around all night to avoid touching the mattress. The room is huge but the floor was not vacuumed well. There was a big piece of carpet that had been replaced but not done well. We were out of our room all day and returned to find no maid service had been done. The maid service person knocked on our door to ask if we wanted anything. We got fresh towels but nothing else. Complimentary breakfast was average, heavy on starches. Some fresh fruit would have been nice. Would do my homework next time. "Nice room, although no view"
Staff was friendly at the front desk. Easy location to get around Red Wing and points around the river. Park is within walking distance, cool place just across the river to eat, visit and hang out. Would stay again. My family and I were on a weekend trip to the quaint little city of Red Wing for another weekend getaway and opted to stay at Best Western Rivertown Inn and Suites..we were very pleased with the spaciousness of the room with queen beds, a couch and recliner..we were on the second floor and had to lug the suitcases up the steps which are fairly wide but it wasn't a bother for us..however the water really did not drain quickly from the bathtub and the fridge never did work..the breakfast was quite varied and tasty on the first morning but somewhat limited on the second day of our stay..all in all the pluses were more than the minuses..will recommend.. Thank you for your review! I have mentioned the problems with room with our maintenance engineer. New tub drain and mini refrigerator has been installed. Please don't hesitate to call the hotel to request first floor next time when making your reservation. BW have not always been the best place to stay. We took a little bit of a gamble when we booked. I was pleasantly surprised. Rooms were big, clean and up to date. Staff was prompt and friendly. Breakfast was hot and plentiful. If ever in Red Wing again, I would stay here. Thanks for a nice visit! Thank you for a wonderful review! 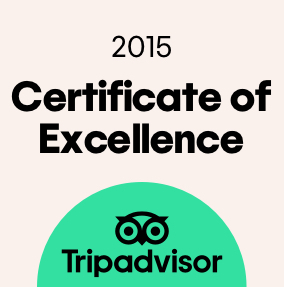 Proud of our staff for providing you a great experience! Look forward to seeing you again sometime! Staff was very friendly. Hot breakfast was very good. Room was clean and well furnished. Soap, lotion and shampoo were in dispensers which was nice. Only complaint is that the room was damp and musty even with air on. Thank you for taking the time to review us! We always appreciate feedback from guest. This has been a very rainy this year. We are working with refrigeration company to resolve climate control issues. We are striving to go green by eliminating small bottles of products. Someone committed a grievous failure in the design of the bathrooms at this hotel. At first, it looked like an ordinary bathroom, perhaps even a nice bathroom. So, I sat down on the toilet ready to take a crap after sitting in a car for 4 hours. I had just gotten comfortable when I noticed the atrocity before me. A full body mirror hung directly in front of the toilet, forcing me to stare into my own eyes during what should have been a moment of bliss. Thanks for ruining my moment, Best Western. So sorry about placement of mirror. Best Western requires a full length mirror in bathroom. That is the only space available. We had them on backside of door. This created a safety issue. No win situation. Please accept our apologies ??. Very nice accomodations and extreme value, which includes a full breakfast. The room we were given was a "themed" room which was both interesting and had a warm feeling regarding the décor. The pool was both inside and out; only draw back was there is no hot tub on the premises. "Leisure stop last min. Stop"
Nice clean friendly place. Everything was up to its great standard. My only issue is the beds were very uncomfortable woke up with a back ache. Hopefully they will be replaced! Breakfast was adequate. Thank you for your comments!! We have recently hired a new cleaning crew and appreciate your feedback! Please stay with us again! We really do appreciate your comments! I have passed them on to our maintenance and housekeeping staff. We are working on your concerns of the room. Please come again!! "Limited options, lesser of the worst"
Better than the Day's Inn, if that's saying something. The hotel is old, and it shows its age. Chances are good your sink may not drain, your toilet may not flush adequately and your AC system will spew humid air into your room. Maybe it'll be clean when you check in, but maybe not. When your room is "refreshed" the next day, expect the bare minimum. You'll probably get a fresh bar of soap. The breakfast may be free, but it is sub-par. Fortunately (if you can say that), there is a Perkin's next door where you can get breakfast, lunch or dinner. The fitness center is awful and is probably more of a dungeon than a workout room. Don't waste your time and get a membership at the Anytime Fitness down the street. In the last two stays, power went out and the back-up system appeared to give out in less than 2 hours, and the fire alarm went off at 1:30 AM. I stayed at this hotel for about 2 months back in 2014 for work, and I've stayed here approximately 17 nights so far this year, again for business. Why do I keep coming back? 1. The beds at least are comfortable, though I try not to think about their cleanliness. 2. BW hotel rewards points are valid at more places throughout the country than competing chains in the area, 3. Aggressive work schedules make a restaurant which serves more than just breakfast or dinner convenient and 4. most of the other hotels in the area are even worse. On behalf of our entire team I would like to apologize for not meeting your expectations. In the future, please communicate we us your dissatisfaction immediately. Thank you. we had an excellent stay at the Best Western in Red Wing, MN. Could not ask for a nicer room or bed and bathroom. Breakfast was really good with so many choices. I would recommend Best Western to other folks visiting Red Wing, MN. We recently stayed two nights in this hotel and I doubt that I can say enough good things about it. The staff were efficient and friendly and never failed to speak to us as we were coming and going throughout our stay. We observed them dealing with a couple of difficult, out-of-line motel guests and they did so pleasantly and patiently. When we asked for tips on good eating places, they named various restaurants and we were never disappointed when we chose one they had recommended. As for our room, it was large and comfortable, though it showed a few signs of wear with a tear in the carpet and could have used a better dusting but none of this was monumental. We had a problem with the seat on our stool, reported it to the front desk and it was remedied immediately. The complimentary breakfast was by far the best I've had in any motel. Each morning they provided various starters like a biscuit with egg, sausage and cheese, as well as waffles and other tempting offerings. Another morning consisted of scrambled eggs, sausages, toast or muffin; again, a cut above the average motel fare. I would definitely return to this place and have no trouble recommending it to anyone. .
What a great place to stay. It is clean and the staff are so friendly. Is in a great location. Their breakfast is fantastic. They have such a good selection of food. Just about anything you could want for a big or small breakfast. I would definitely stay there again. We picked this hotel because of its convenient location. Our group of 16 (8 rooms) was on the last day of a bike tour in Minnesota. We had easy access to our route to Cannon Falls. The staff was friendly. Check in took a long time because the one person on duty at the desk was distracted by phone calls. Our room was comfortable with plenty of space for bikes and gear. All in all, a good stay. Thank you for choosing us to accommodate the lodging needs of your group! Our rooms are spacious and we provide a nice conversation area. We are very conveniently located to Cannon Falls Bike Trail. Your group was a delightful group! Sorry about the delay in your check in experience. We are researching ways to correct the dilemma of check in and incoming phone calls. We truly do appreciate your feedback. Please come and stay with us again! Comfortable, reasonable with extremely friendly service, we had a great overall experience. Current remodeling is making the place look like new. The evening and morning counter folks were cheerful, interested in us, and folksy, all at the same time. Made reservation several months ahead of time and requested a first floor room but was not given one at the time of check-in. Hair dryer was not working and it was hard to connect to the WiFi. The only good time was that a Perkins restaurant was attached to the hotel so we didn't have to ride somewhere to go to eat. We booked this room only because it was the only thing left in town on short notice. If I had to do it over, I would not book it again. The main reason for my low rating is this: the price charged for this room was simply much too high. If the hotel is going to choose to charge over $200 for the room per night, then it needs to provide a much better product. The hotel is on the older side. When you walk in the door, it immediately smells like a hotel. Areas of the room were not particularly clean. One light fixture was ready to fall off. The cover plate for the fixture was not attached to the ceiling. One of the pipes for the sprinkler system was sticking a couple inches out of the wall. The outlet plate did not completely cover the hole cut out of the wall for the outlet. A plastic cover meant to cover another cut-out in the wall was hanging out. The sofa and chair in the room (which was spacious) were both like sitting on plywood. It took sometimes 5 or 6 attempts with the keycard before the door would open. None of these are huge deals in an of themselves, but if you are going to charge over $200 per night for the room, then you must deliver a better product. Don't let the part of the name "Inn and Suites" lead you to think that this is a little better hotel. This product was not worth the price charged for it. If you are going to book a room here, don't pay more than the pretty normal hotel room rate. One last thing. I'm starting to wonder if hotels are no longer training their employees to ask upon checkout if everything was ok.
On be half of our entire staff I would like to apologize for failing to meet your expectations. I will share your comments with staff. We will use them in future training and planning sessions. Thank you for bringing your concerns to our attention. I wish that you would have mentioned them during your stay so that we were able to make amends then. This hotel was beyond my expectations. Large room, 2 beds, couch, large easy chair with ottoman, refrigerator and new bathroom. Very comfortable and quiet. The staff was very helpful. I would certainly recommend this hotel. Thank you! We value your opinion and appreciate your compliments. Our rooms are large and offer a nice conversation area. We pride ourselves on the quietness off our hotel. "We'll give a rating of "GOOD""
We asked to check in early, they said "Sure!". Took our payment then asked us to check back in an hour for keys. ?? Not sure that's checking in early. Anyway, the place is outdated, but quiet & clean. There are 2 suitcase stands, which are handy. The water pressure is great! Their bath products aren't great smelling. Bring your own. The indoor/outdoor pool was perfect on day 4 of an extreme heat advisory! The staff was accommodating. The parking lot is well lit-important to us at 2am when we returned from a concert at the casino. The fridge & freezer worked well. We would stay here again, but I really hope they update their beds & bedding before we return. We appreciate your comments. Thank you for taking the time to review us. Owner is in the process of updating and upgrading the amenities. The weekend was unique with the fact that TI had Friday AND Saturday night concerts which had us literally flipping the rooms within a 4 hour time span. Hence, early check in confusion. The hotel wasn't itself didn't really disappoint. I knew I what I was going to get, I wasn't expecting anything more than a bed and a tv. However, the service in person and on the phone was pretty poor. Sorry that we did not meet or exceed your expectations. I have shared your comments with the staff and used them has a training tool. 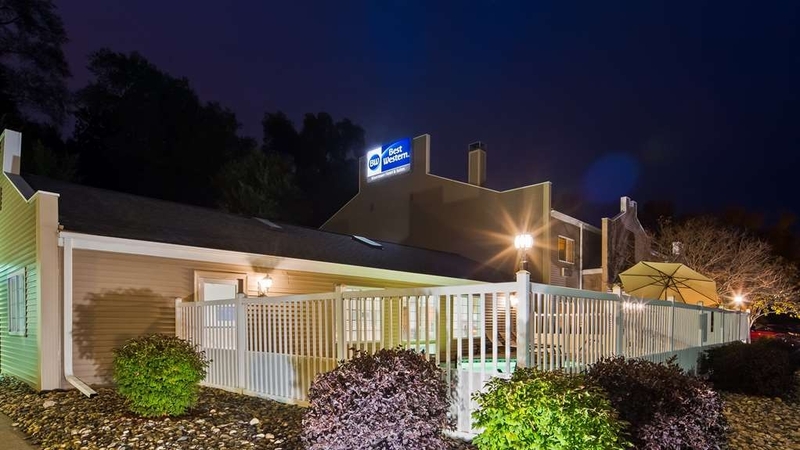 "Hotel Review - Best Western, Red Wing, MN"
The hotel was clean, staff was friendly and helpful regarding restaurants in the area. Hotel was quiet during the night. A very good breakfast with many food selections, always a plus! Would definitely stay there again. Happy to hear that you enjoyed your stay!! Thank you for choosing to stay with us. Look forward to seeing you again! Love the size of the room, 2 queen beds, couch, chair and coffee table and another table along side the large mirror in our room. First hotel I've been to where there was ample outlets for all todays electronics. Room lacked air quality/venting, wished we could have opened a window, the steam from our and prior guests showers (ran the bathroom fan 24/7) caused spot mold on the upper shower wall-just needed to be scrubbed-something I shared with the front desk. Great customer service, our fridge quit working first night and shortly after advising front desk they had another one in our room for us. Breakfast was filling-nothing super great but it was a hot breakfast with different choices daily and since we were there for 3 nights we appreciated a change. Nice place to stay. Greatly appreciate all your kind comments! Glad to hear that your enjoyed your stay.We will use them to improve the quality of future stays! "Ok, but missing and lacking." Stay was ok, but just not as nice as we remember the last time. Pool wasn't heated. Didn't even acknowledge our requests for 1st floor room or one facing parking lot to keep eye on Harley. Breakfast ok, but again missing something. Nice place, but just not how we remember last time. On behave of our entire team please accept our sincerest apology for not meeting your expectations. When there are special request we try to accommodate them. Unfortunately, sometimes we are unable to honor requests. Please call hotel directly when you have a special need that needs to be accommodated. Thanks! My second stay at BEST WESTERN Rivertown Inn & Suites. I love this hotel because it is so quiet, centrally located and clean. This trip I stayed 4 nights. The hotel was booked solid due to a convention yet they managed to keep up with housekeeping and customer service. The breakfast was ok. Not a huge breakfast person but they had a nice variety that changed everyday I was there. I love that coffee is available 24 hours in the lobby. I am a huge coffee drinker and the little machine in the rooms don't do it for me, I used the refrigerator and the microwave this trip both functioned well. Someone in an earlier review stated it was old, Mine was fine. They only bad thing is there is no elevator which makes it hard for elderly and handicapped people but there is a first floor. The front desk people at night and day were fine, the night crew were a bit more fun but both day and night were friendly and efficient. Thank you for your review! The entire staff work very hard to make your stay enjoyable. Nice to hear your comments. Please stay with us again!! 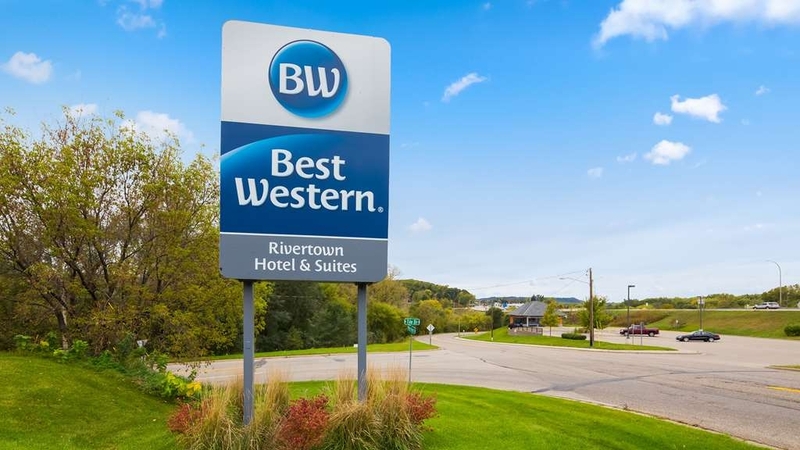 "Good experience at BW Rivertown"
We have stayed at the Best Western Rivertown Hotel and Suites in Red Wing, Minn. every July for the past 16 years. Our experience there is always top-notch. The hotel has recently remodeled its rooms and redone the facade. It is really QUIET and that's why we like staying there. Breakfast available daily. Indoor/outdoor swim-thru pool.....always a treat. You are so kind! Thank you for your comments! Looking forward to seeing you again! Spent 1 week here..omg..the headboard fell off the wall while I was sleeping, the bathtub drain did not work, toliet seat slid everytime you sat on it, microwave was outdated and hard to use to heat food doorlock had issues..wouldn't always lock, no elevator to get to second floor....very hard to maneuver when you have two kids and a week's worth of baggage. Pool was nice looking but the water was so cold...not even close to the temperature it was suppoze to be..and debris was blowing into the pool from the outside. On behave of our entire staff I would like to apologize for not meeting your expectations. We have communicated your comments to necessary department heads. We booked this room through trip advisor. Nice place and real friendly front desk staff especially Judy . We told her we were honeymooning. After we got back from dinner on night one there was a bag outside our door of treats! Didn't care for the dispensers in the bathroom, housekeeping wasn't bad but not the greatest. And our tub and sink was very slow on draining. We addressed this to maintenance but it never got resolved. Being we really didn't spend a lot of time in our room it wasn't a huge deal. Breakfast was average. Lots of construction going on in town when we were there. Thank you for your review. I have communicated your maintenance concerns to our new maintenance engineer. On behave our entire staff please accept our apology. "The Cons Outweighed the Few Pros"
I decided to try this hotel because it looked nicer than the $60/night hotels and wanted to save $50 by not staying at the St James. Great pool, front desk staff was friendly but not helpful in restaurant suggestions. Room was dirty (smashed food on floor when we moved the auto man, fingernail alongside the bed that I found in the AM), missed out on the breakfast as we were told the wrong time, the bed was horrifically hard and we could hear our neighbor snoring. Hotel boasted a balcony, but we had no doorway onto balcony, only a window to view it. I'd spend more to stay at the St James next time. Sorry that you were disappointed. Our rooms have room codes. The room code for your reservation was not for a balcony room. If you want to make special request, please call hotels directly so you won't be disappointed. It was unfortunate that you missed breakfast. I bought all your other comments to the attention of staff. Thank you for your review. "Nice Place for a visit to an old Friend"
We lived in Minnesota for 22 years and often came to Red wing. Red Wing has changed in many ways since we were last here over 10 years ago but it is still I beautiful town to visit...in spite of half of main street being torn up causing a few headaches in getting around. The BW was the perfect place for us to stay while my wife visited a former work friend she has not seen for 12 years. Thanks BW for a comfortable stay. Thank you for a wonderful review! Glad that you enjoyed your stay! I had a decent stay. I stayed two nights and my room was clean and larger than average but it had a smaller bathroom as a result. I didn't mind. Rather than bars of soap, they had soap dispensers at the sink and in the shower. My king-sized bed could have been more comfortable, it felt a bit hard but I guess that's just a matter of preference. There was a microwave and fridge in my room but I never used them. Breakfast was good, slightly better than average hotel fare. The pool was being serviced when I was there, which was a bit disappointing but it made more sense for them to do it on a Tuesday rather than the weekend, so I understand. It was also a bit annoying not being able to make a left out of the parking lot without going some roundabout way, but overall for the price and room size this is the place I would choose again, if ever in Red Wing. Pleased to hear that you enjoyed your stay. In an effort to going green we switched to the dispensers of hygiene products. However, we do offer the bottles upon request. Thank you for taking the time to review us!! Please do, come again! This family run hotel was in a great location, very clean, and comfortable. Although not right in downtown Red Wing, it was just a short drive to the downtown shops and restaurants. It was reasonably priced and a good value. Thank you for your gracious review! We look forward to seeing you on any return visit to Red Wing! We had a great stay at the best Western Rivertown. The staff was very friendly and the rooms were very clean. My only complaint is that we couldn't stay longer. I would recommend this hotel to anyone. I wish we had been there when it was warmer so that we could've enjoyed the pool more. Thank you for your lovely review! Proud that our team did a great job. Please come again when you can enjoy the pool! The hotel was the cheapest we could find comparable to other hotels in the area. The staff was extremely friendly and welcoming. The rooms and over all feel of the hotel was clean and put together. Complimentary breakfast available in the morning which is nice. I will definitely be going back to a Best Western when they are available during my travels and would recommend them to all! Thank you for your very nice review!! Glad to hear that you enjoyed your stay. Thanks for your patronage. Look forward to see you again. Room was nice but trying to get the room was not cool! Rates were super inflated if trying to get in person. Go online before checking in and book to get at least a 25% discount! We had to stand at the desk and book online over our phone to get a confirmation # only to then wait for 20-30 minutes for it to pop up in the system. Once we got our room it was nice and spacious and clean. Breakfast was nice. Thanks for your comments. I will speak with staff member regarding the quality of your service. Will use it as a training tool. She is a new employee. Please accept our sincerest apology. Come again. "We look forward to staying here again! " Great stay! We arrived to a super clean room with a print out of area shopping, restaurants, and sights provided by area Chamber of Commerce. We planned our night around coupons hotel provided on the back! We had a great breakfast in the a.m. They have a waffle maker that makes 4 small waffles rather than 1 jumbo size lile other hotels. They provide all the fixins for you to make waffles just like you like them! Dont miss out on whipped cream in small fridge! There was a nice variety of options for breakfast. Great coffee provided 24-7! Check out the pool pics! You can swim inside or outside! We were bummed we forgot our bathing suits. Pool area is clean and has great lounge chairs! We will be back for more fun in Red Wing!! Thank you for a wonderful review!! Guest love the build your own waffles, especially the mini waffles. Coffee, hot tea and cocoa are available 24/7 in the lobby. Please do come and stay again! 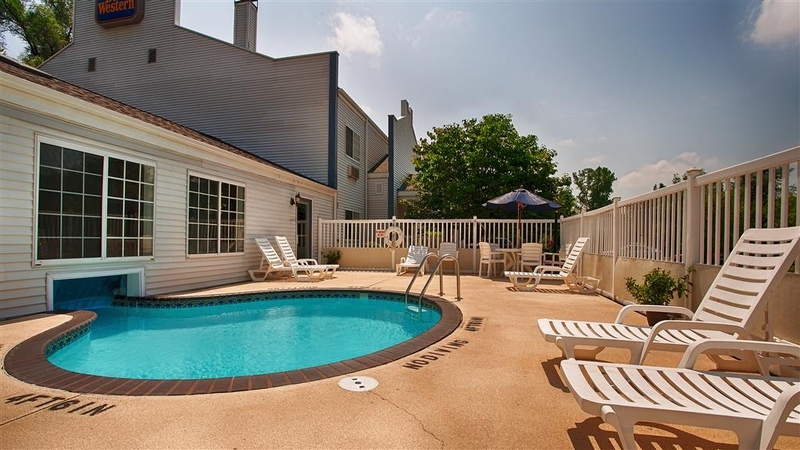 Our pool is unique in the fact that you can swim from indoor pool to the out door pool. "Nice hotel! In process of residing the building"
Very nice hotel. Nice rooms with comfortable bed. Breakfast was average Best Western type breakfast without hot items. Good customer service. No concerns. Comfortable stay. Pool looks great, but we didn't use it. Thank you for your nice review! 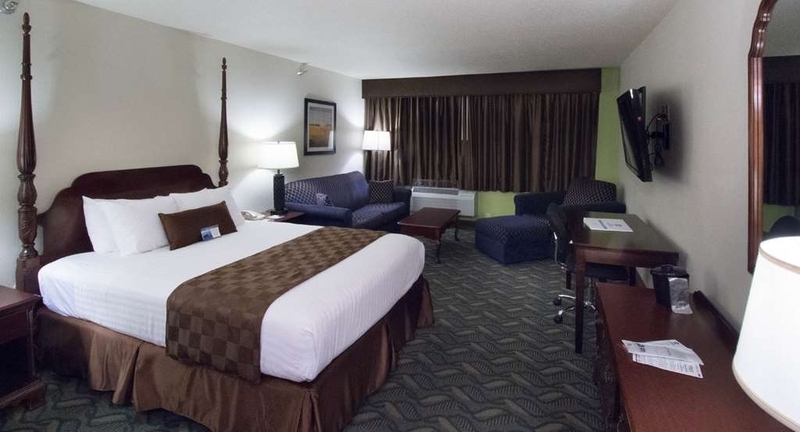 Our rooms are larger and more spacious than most hotels. The rooms provide a nice conversation area as well as a comfortable task chair and desk. Glad that you enjoyed you stay. Please come again! I loved the Best Western. Great location. We walked to Perkins for supper. Hotel was very quiet. Very nice breakfast. The front desk was very helpful with our questions. This was the best place we have stayed in Red Wing. Thank you for a wonderful review! Our rooms are spacious and quiet. Nice having Perkins next door. Our breakfast is an enhance breakfast with build your own waffle and oatmeal bowl wit a variety of toppings. Please come again. Had a nice stay in red wing at the best western. The hotel was very quiet, the front desk workers very pleasant. I got up early and wandered to the lobby so I didn't wake up my Significant other. There was fresh brewed coffee, comfortable couches. The room was clean and fairly updated. I did not like the shampoo, and soap dispensers. I prefer the bottles and bars other than that it was fine. Close to the main road yet quiet. Restaurants were close. Thank you for the kind words. Happy to hear you enjoyed your stay at our hotel! We always have coffee, hot tea and cocoa available in our lobby 24 hours a day. In an effort to go green, we went with shampoo, conditioner and body gel in a dispenser. We have individual product available at front desk for the asking. Our rooms are large and away from the traffic making them very quiet and peaceful. Please stay again. Thank you for your glowing review!! Happy to hear that you enjoyed the pool! The room you stayed in is very comfy and cozy with the cabin decor! Please come again! "Probably The Best Hotel In Red Wing"
I feel like quite the Southern Minnesota hotel and motel traveler as of late. I recently had a chance to stay here a few days ago. This Best Western is nestled on the corner of a grassy hill. Upon entering, you are met by a spacious, welcoming lobby. Even as I was entering the door, the front desk person was greeting me. The front desk was very nice and very welcoming: definitely willing to help if I had any questions. Definitely more friendly than a lot of hotel front desk staff that I have ran into in my stays throughout Minnesota. We got checked in promptly and he even assisted me with signing up for Best Western rewards, which was the first time any hotel has asked me if I'd like to join. it was refreshing. Our room was a 1 King bed suite on the first floor of the hotel all the way at the end of the hallway. The room was very pretty, with an alright view of the hillside and shed beyond. The room was updated, new, and clean. The TV inside the room was absolutely huge compared to other televisions I have seen in other hotel rooms. The bathroom was very spacious with a giant sink area for me to put my on my makeup properly. It also looked like a perfect room to accommodate Handicapped persons. There were many mirrors throughout the room, HUGE mirrors, perfect for taking that on-point, on-fleek selfie in the mirror. My only tiny little gripe about the place is that all of our Room Keys stopped working. I understand that there was is warning at the front desk about the Room Keys and to keep them away from all manner of electronics. But realistically, in this day and age, how the heck am I supposed to keep it away from electronics? I felt like their Room Keys were probably the touchiest, most unruly cards that I have ever dealt with. It also made us have an awkward trip to the front desk at 1:30 AM to get a different key after visiting a friend's hotel room. Overall, if you are looking for a quiet, quaint, and updated place to stay... I would definitely say this should be your choice. I don't think you will regret it. Thank you for your wonderful review!! Happy to hear that you enjoy your stay! Come again! "BAD PILLOWS, BAD COFFEE, WONDERFUL HOT TUB!" This hotel's rooms are each decorated along a different theme. Ours was an Asian Theme, which was difficult to understand. not well put together. I saw a Lodge Themed room, and it was beautiful. Breakfast items were old and poor quality. NO COFFEE in breakfast area or lobby for a long period of time. When I finally did get a cup of coffee, it was really bad. Pillows in room were awful. I opted for a rolled up bath towel and my husband had an awful headache in the morning. But the hot tub was ABSOLUTELY THE BEST HOT TUB we've every experienced in a hotel. It was deep and extra wide and filled quickly. We loved it! Sorry that we did not meet your expectations. We have used your comments as a training tool to improve. It is unfortunate that the in-room coffee pot had been unplugged. The room you stayed in is one of our most requested room. New pillows have been received. Thank you for taking the time to review us. Very nice! We had a nice stay and the staff was very helpful and friendly. We would definitely stay there again. We really enjoyed the indoor/outdoor pool. It was fun and very comfortable to swim outside in Minnesota in February. Thank You for your lovely review!! Always a delight to see guest enjoying the pool. Look forward to you staying with us again. No elevator, so if stairs are difficult, request ground floor rooms. We had a corner 1st floor room that was spacious. The bed was semi-firm, but comfortable. Unfortunately, there is no hot tub. The pool was clean, but with the indoor/outdoor, it stayed cool. The breakfast did not have any sausage or bacon, but did have a choice of breads/bakery products, some fresh fruit, yogurt and cereal. Thank you for your nice comments! Our rooms are spacious and have a nice sitting area for your comfort. True, we do not have an elevator or hot tub. We do try to honor special requests. Hope that you will stay with us again. bathroom needed a little work and shower was backing up, reported to front desk at checkout and hopefully they will fix it. Otherwise very nice hotel, kinda pricy but we were there for New Years Eve so Im sure the rates were higher because of that. Thank you for your review! Front Desk Attendant forwarded your concerns regarding room bathroom needing some repairs to maintenance. All completed. 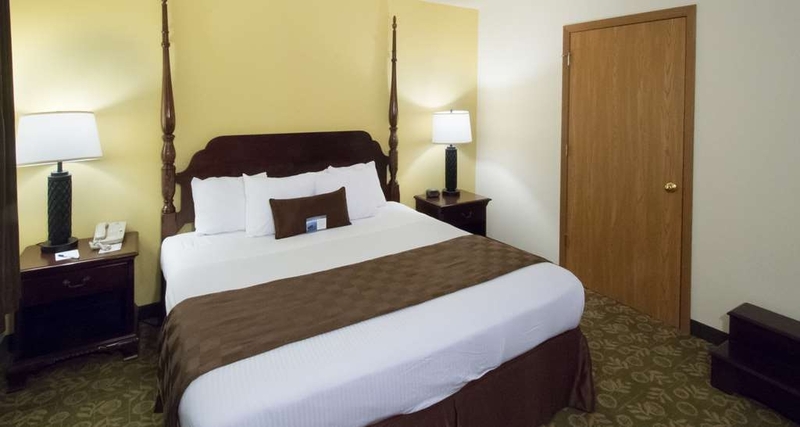 We do have larger rooms for added comfort during your stay. Come again! "No hot tub! But nice pool." Don't stay here if you were hoping to unwind in a hot tub at the end of a long day. It has a great indoor/outdoor pool but no hot tub! I learned a lesson to always ask. Bright side - the rooms are large and comfortable and the breakfast had a nice variety. It's not Perkins quality but is included in the room price. The rooms are a tad spendy I thought which could be why we seemed to be the only people in the hotel but guessing it's very busy in the summer. Thank you for your review! It is true, we do not have a hot tub in pool area. 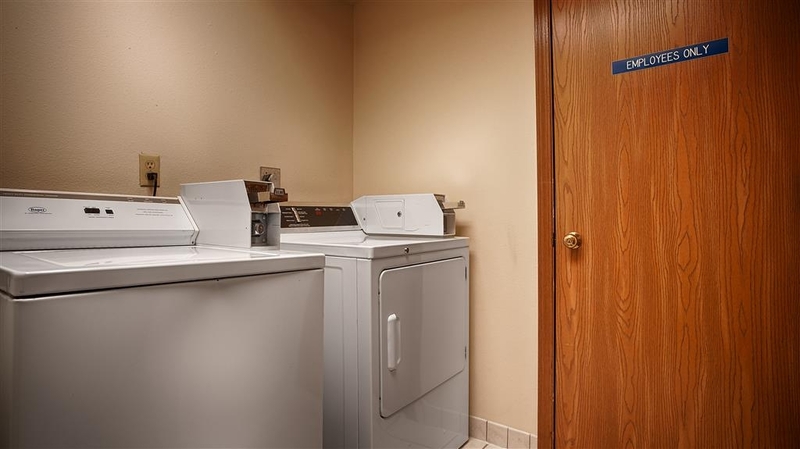 We do have whirlpool suites available. We do keep busy in the summer time. Holiday season is usually our slow time which means a quiet stay. Breakfast is always included with the room. 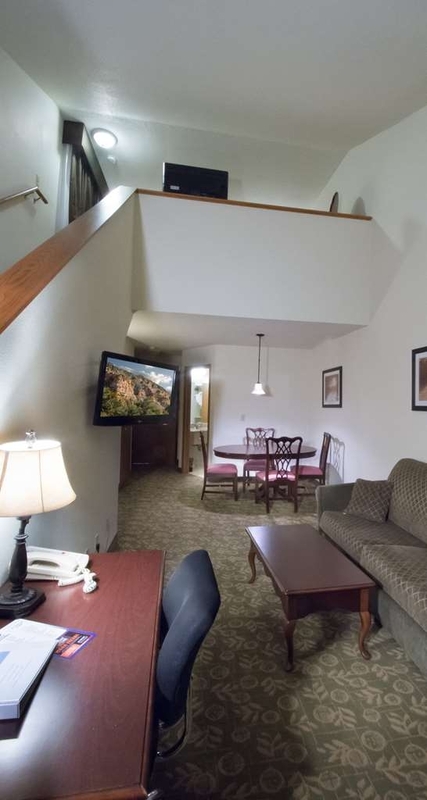 Our rooms are large and include a seating area for your comfort. Thanks for staying with us! "Fun room and great pool!!!" We had a loft style room which was great and would work wonderful for children. The pool is very neat in that you can swim from the main pool to a small outdoor pool which is heated even during the winter. How cool! Thank you for your review! Our lofts are set up nicely for families. King bed upstairs. Down stairs has a comfortable seating area that includes a sofa sleeper and comfortable chair for relaxing and watching TV. There is also a dining area with table for four plus a dry bar area with refrigerator, microwave and coffee maker. Nice area to have family game night!. Our pool is heated and opened year round. Come on back and enjoy a winter stay!!! The motel was very clean. Check in was smooth. Room was large and beds were comfortable. Our room smelled a little musty, but it also had a whirlpool in the room- so thinking hard to get the smell out...Breakfast was good...nothing over the top, but something for everyone. Appreciate you review! Thanks! We do strive to excel in cleanliness for the comfort of our guest. Please do stay again! Two of our 6 rooms smelled like urine. The beds were so hard we all had trouble sleeping.Because of a reservation mix-up that wasn't the hotel's fault we had to check out and check back in and change rooms. The front desk staff did not make that easy and we felt like we were imposing on him to do his job. We didn't complain about the beds to the staff because we didn't figure they could change the beds- seriously they were really bad. Sorry that we didn't meet your expectations. Comfort of beds is a difficult thing to address due to personal preference. We have investigated the smell but it had dissipated. Just to be sure, we have had the carpets and upholstery cleaned. Thanks for letting us know about the smell. The staff were very friendly and helpful. The room was a nice size and the beds were very comfortable. Nice lobby area for people to gather in. Breakfast was so, so, but it is located right next to a Perkins. Would stay here again. Thanks for your review!! Happy to hear that you enjoyed our large rooms. We have recently up dated the lobby to encourage guest to socialize there. Come stay with us again, please. We stayed for one night. The room was clean. It had a couch and chair with an ottoman. Possibly a little big for the room, but still it was nice to have a comfortable chair in which to read. We were on the ground floor and had a small patio outside facing the parking lot. The wifi worked well. The price was reasonable and included breakfast. The breakfast room was small and it only had one table with regular chairs. The rest of the tables were high with bar room height chairs which I find uncomfortable. There is a Perkins next door, but we refer to eat at a locally owned restaurant. We tried the Red Wing Brewery and enjoyed a great pizza. Thank you for your review. Good choice of the room with the patio. We will forward your comments to the owner as decisions are being made regarding new furnishing in rooms. We recently added second table of low chairs to the breakfast room. Please come again! Loved the in-out pool, clean rooms and satisfactory brkft. 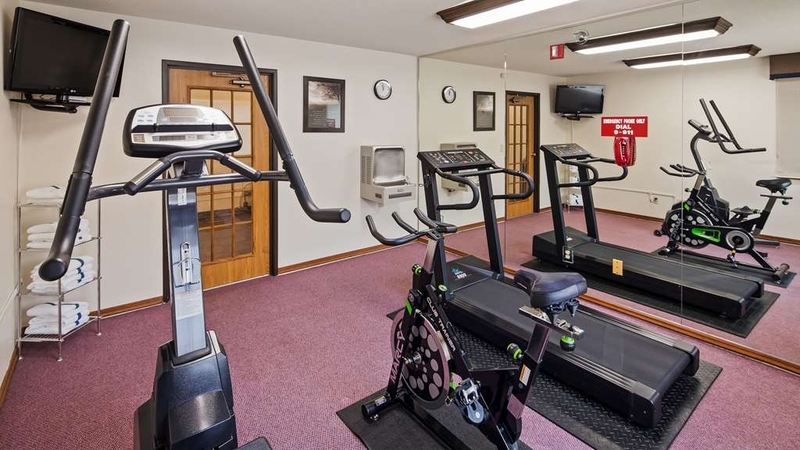 The spacious room and bath met all of our expectations and the motel is close to the Cannon Falls Bike Trail. My bike was stolen from my car rack--the lock was picked. No cameras in lot--maybe take bikes into your room??? Sorry to hear about the loss of your bike! Owner is taking action by installing more lighting around building and possibly cameras in the parking lot. Very pleased that you enjoyed your stay at our hotel. Our pool is very unique as it is a swim thru pool in Minnesota that is opened year round. 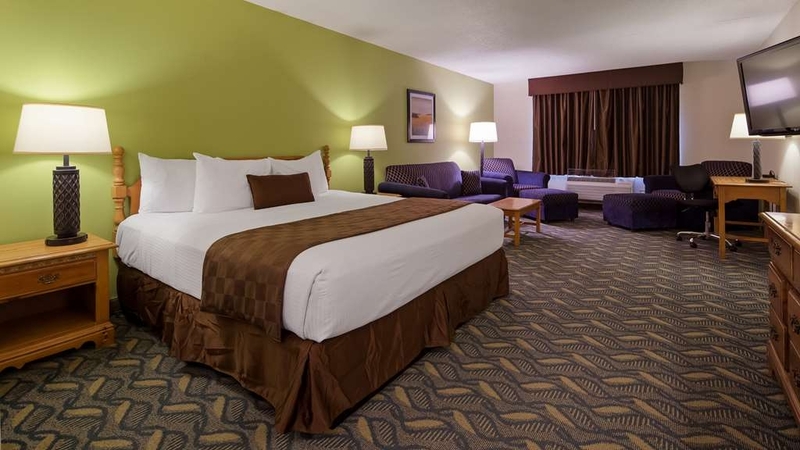 Our large spacious rooms are a plus when traveling with a group. By all means, bring bikes indoors. Please stay again! NO elevator. You have to drag your stuff up stairs. That is not helpful if your wife travels with 1/2 the contents of your home. We looked at breakfast and decided to eat in Red Wing at Hanisch Bakery and Coffee Shop and glad we did. I will review later. It was a great place for breakfast. Red Wing is a nice town! Hanisch's Bakery and Coffee Shop is truly a gem! We are a two story hotel. When it was built the decision was made not to put in an elevator. Please feel free when making reservations to request first floor room. Thank you! 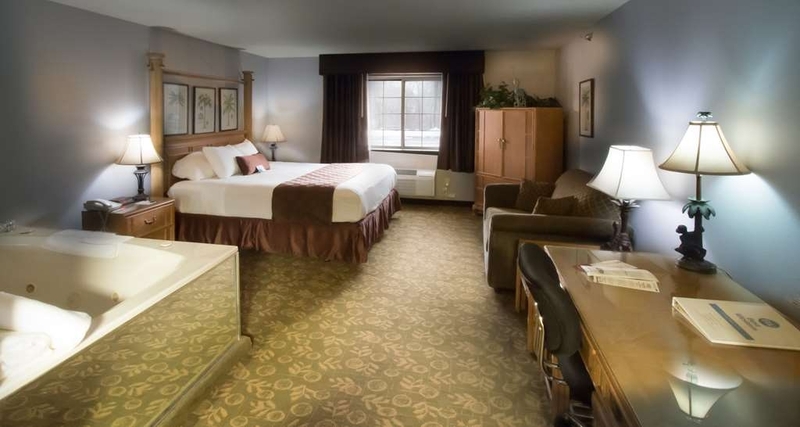 "Best Western Rivertown Inn & Suites, Red Wing, MINNESOTA"
Thank you for your review!! Our rooms are very spacious to provided added comfort for our guest. I apologize that you weren't informed of our breakfast offering. We have an American fare breakfast every morning. Make your own waffle, hot egg and meat, cereals, fruit, pastries, yogurt, coffee, teas and juice. Come again! We were here for 5 nights over the Labor Day weekend. Even allowing for the hotel being full, we were very disappointed in the lack of housekeeping.The first day, our room wasn't cleaned until after 4 and we tracked down the housekeeper for the towels! The day clerk was overwhelmed between checking out folks and serving breakfast. This continue for our entire stay and all we asked for clean towels and the trash to be emptied. Sorry that we disappointed you! We have recently hired several new housekeepers. please give us another try.